The aim of this research work is to develop a novel integrated framework for improving the availability of Water Circulation System (WCS) of a thermal power industry located in the northern part of India. 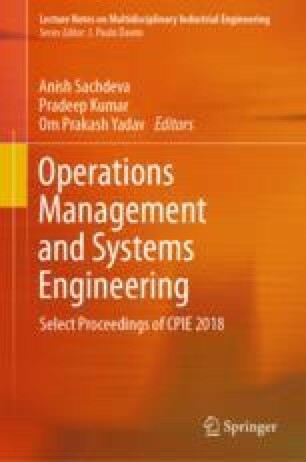 Qualitative information related to system’s operation has been collected on the basis of feedback from maintenance experts/log book record and using that information, Failure Mode and Effect Analysis (FMEA) sheet was generated. Fuzzy ratings have been assigned by the experts on the basis of designed linguistic scale for three risk factors, namely occurrence probability (O), severity probability (S), and detection probability (D). Fuzzy Risk Priority Number (FRPN) has been computed for each failure cause and ranking was done in descending order. Further, for testing the stability and robustness of ranking results fuzzy Evaluation Based on Distance from Average Solution (EDAS) approach has been applied within fuzzy FMEA approach. Appraisal score values have been computed as EDAS output and ranking of failure causes was done. Ranking results were compared for effective decision-making of critical failure causes. The implork shows its effectiveness in overcoming the limitations of rule base FMEA approach. The ranking results would be supplied to the maintenance manager of the plant for developing an effective maintenance program for WCS. The analysis result will be highly useful in minimizing the total operational cost of the considered unit.